Learn about the most interesting places in the world as you play through colorful and unique mosaics puzzles! 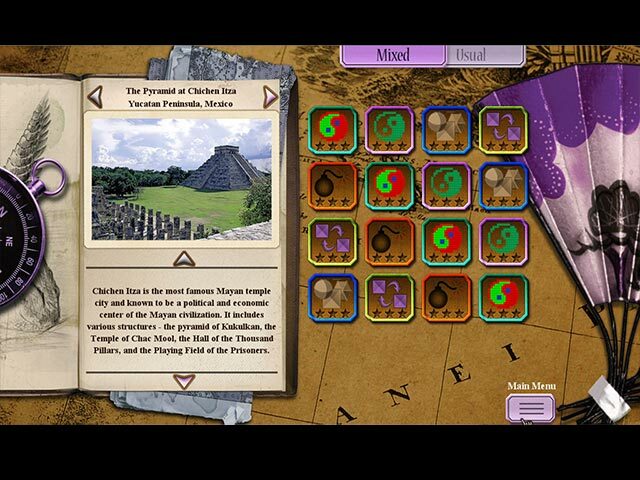 You’ll discover fascinating things about some of the world’s most incredible temples, cities, and monuments as you progress through over 200 unique mosaic levels. Stimulate your curiosity and your mental prowess with Worlds Greatest Places Mosaics! World's Greatest Places Mosaics is rated 2.8 out of 5 by 38. Rated 5 out of 5 by 1HappyCat from Loved It - Hook, Line and Sinker Of all the puzzle games, this has been the most challenging and the most rewarding mosaic experience. Once I learned the trick to avoiding the dreaded X's, the game just drew me in. My favourite game was the swap grid, which I would love to have an entire game devoted to only this type of puzzle. On the downside for the swap puzzles: there was little colour distinction between the tiles in their correct/incorrect positions, particularly with the darker colours. I hope to see more of these unique puzzles from this developer. Bravo! Rated 5 out of 5 by unemployed from A brilliant game but beware ! I really love this game with its level of challenge and different game play but there is a 'gremlin within' ( and no I wasn't trying to report a technical issue ) I am just giving my honest opinion as to how I found the game. I enjoyed the hours trial but for the 'gremlin within' that spolt the full enjoyment of an otherwise brilliant game. I def recommend this game but just be aware. And what is the little wheel that appears in the corner ? Rated 5 out of 5 by bjcs319 from Want more like this At first I did not like this game. The shape factor threw me for a little while. But, after I got used to it, I loved this game. I hop there are more coming like this. Rated 5 out of 5 by lagrimes from Fun new mosaics Loved the color and the innovation of using shapes. Made it just challenging enough to keep my interest. You don't have t do the puzzles in order, which is great. Sometimes I get stuck and want to move on for a bit. Also, you don't have to have a certain number of points to move to the next level. Music is soothing and graphics are good. My only complaint is that it is short; not enough levels of any kind. I hope they remedy this in a revisit. I'd buy in a minute! Rated 5 out of 5 by lininindy from WOW - You have to have your thinking cap on! But it's sooo worth it! Rated 5 out of 5 by kerith90angel from This will appeal to a player seasoned in the color grid games. I adore Nonongrams to begin with-- especially the colored type. They have added some twists to this game and I liked them all but one.... THE SWAPPING grid. NOT a hit with me. I am really seasoned playing this type of game but I really couldn't understand what to do when it came to the swapping grid. Thankfully, this Dev. gave us unlimited hints -a huge hit with me- and secondly, I didn't need to play the swap to progress --at least in the demo. So I went and played a different grid. I also LOVED the custom setting. BRAVO! This Developer is seriously catering to all of us and giving us something new to challenge our brains. Yikes, with the "shapes" I kept hitting the wrong ones, until I finally got the hang of it. I am not so sure this particular game will be a hit with someone new to this genre. If you are new to this type of game I would suggest playing the 1 color grids first, then move to a 3 color grid selection and save shapes and swapping for last. These are TRICKY! I know when I'm really digging a game when the demo shuts it off and I say, "BUMMER!". So I had to buy this game to play some more. I would highly suggest this, but again, I really can't stand the swapping grids. If I HAVE to play them to progress I guess I'll have to learn via the forums or other reviews what the trick is. In case anyone cares, I learned a trick with these type of games....--especially if you don't have unlimited hints and you are at the puzzles toward the end of the game which are harder generally...-- which is, I keep my cell phone on the camera setting and snap a picture of each color if I am nearly at the end of my X's which will end the session for restart. Upon reboot of that session again, fill in the spots you previously played using your camera phone as reference to the squares you completed before you were X'd out. Rated 5 out of 5 by pennmom36 from Mr. Penguin Is Gonna Be Upset Today! Somebody put on their thinking cap and created one of the most unusual griddler games I've ever seen. I love it when devs think outside the box, sometimes it works, sometimes it doesn't, this time it really works! You even get to choose the difficulty of the puzzles with Casual which has no timer, numbers are crossed off one by one and the hint timer recharges quickly. Normal mode has a timer with plenty of time, numbers are still crossed off one by one, and the hint recharges slowly. Expert mode gives you limited time, numbers are crossed off when an entire row is complete and the hint recharges very slowly. Wait! There's a custom mode which allows you to choose a timer, how long the hint takes to recharge from 10-120 seconds, how many mistakes you are allowed from 1-5, whether you want the numbers crossed off one by one or when an entire row is completed, and whether you want a time bonus. Not only do you get to create beautiful and colorful pictures, but you get to create pictures with depth. There are the normal one color grids, and the three color grids where you change the colors by clicking on the color bubble which helps you solve the puzzle when you get stumped. Then the grids get really exciting with the introduction of shapes. This puzzle allows you to not only click three color options, but shapes as well! There's also a swap type grid and a bomb type grid where you figure out where the explosives are hidden and avoid them. The coolest part is that you can choose the order you want to play the grids in a level, if you want to play the last game first, you can! It's a good thing Mrs. Penguin is busy redecorating her house for Uncle Aaron, because I feel a little guilty enjoying this unique griddler game. This game is very challenging, some of the grids seemed impossible to complete without using a hint or two, but perhaps I just need to put on my thinking cap as well, enjoy! Rated 5 out of 5 by Camilla1212 from Challenging! First there were games with one color; then three colors. Now, add shapes! Up to three colors and three shapes creates a complexity that is, simply, hard! I've only played for 19 minutes, and I bought the game. It's hard and it's really fun! Rated 5 out of 5 by LogieBaby from At last..a rival to Fantasy Mosaics !! 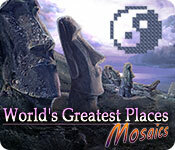 World's Greatest Places Mosaics is a breath of fresh air in the realm of grid puzzle games. It is unique in that each 5 grid segment contains 5 different kinds of puzzles. The first is a 3 color grid ala Fantasy Mosaic. The second is a simple one color grid. Then the fun and the difficulty starts. The third segment involves correctly placing shapes. These include squares, hexagons and circles. We are told how many of each shape is needed on both vertical and horizontal lines, the hard part, and I do mean hard, is where do the shapes go. Fortunately there is a hint available and the hint recharges very quickly. The fourth segment requires swapping squares in a tri-color grid. This is probably the most confusing of the 5. If a square can be relocated it is highlighted and the player then can move it to a spot consistent with the vertical or horizontal numbers located outside the grid. The one flaw in segment 4 is that 2 slightly different shades of dark blue are used, at least in the second group of five. The last part of a section uses bombs. 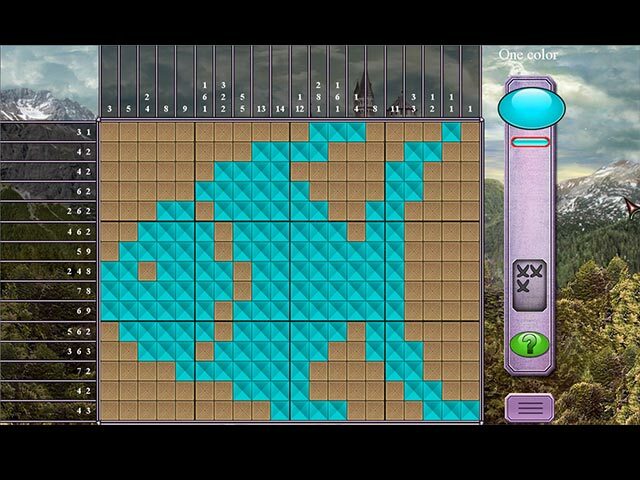 It is just like the old game Minesweeper. Hit a bomb and the level fails. The game as a whole has a tutorial which is a bit confusing. This tutorial is absolutely necessary. When I play Fantasy Mosaics and I have most of the 13 issued to date, I rarely rely on hints. With this new game, hints will be a much needed ally. If there is a downside to this clever game it is that the game title doesn't live up to itself. When a grid is finished there is no indication of any place at all. 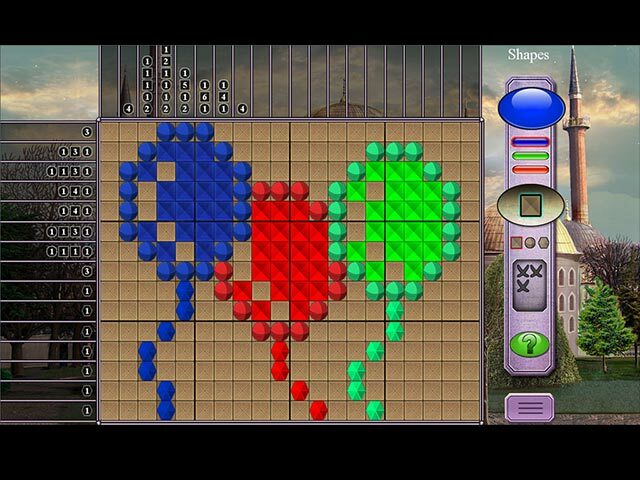 Nevertheless this griddler is so novel and so challenging that it is a must have for those of us who enjoy mosaic style games. Give it a shot but be warned: this is a hair puller for sure. Rated 4 out of 5 by cee8mee from Different than most If you look at the reviews of the unsatisfied, ie: the 1 star reviews, you notice the same complaint over and over. Marking mistakes for blanking out known unused squares. However, this game does not allow you to put a blank in a spot where ANOTHER COLOR will go, therefore, the mistakes counted by the game add up if you try to blank out the squares that do not appear in the current color. So, the majority of the bad reviews are for those who didn't figure that out. It is common in nonograms of more than one color to allow blanking in EACH color, separate from the blanks remaining after solving the whole grid. I learned my lesson after failing a few times. The directions don't seem to mention this, and if you play nonograms regularly, I can see where some might think the devs messed up. They would be wrong. While I'm not fond of this variation in rules (hence my 4 star rating) it isn't an error on their part. So as far as giving it 1 star, those who did for this reason are simply uninformed of the rules. Otherwise, nice game play, not too fond of the swapping puzzles, shapes are just a different way to differentiate what goes where. Very creative, may end up buying this one, and that says a lot as I rarely purchase. Learn about the most interesting places in the world as you play through colorful and unique mosaics puzzles!